Little Kickers founder, CEO Christine Stanschus and her husband Frank, visited Australia from their home in Canada recently to say hello to our franchisees and talk about the exciting times ahead for Little Kickers. They came via the UK where they celebrated 10 years of Little Kickers and took part in the annual franchisee conference. It was their first time Down Under and with the Little Kickers Australia team growing rapidly, there was plenty of meeting and greeting to be done - Aussie style! First stop on the East Coast was Sydney. Chris and Frank spent some time catching up with NSW master franchisee Dan Kelland and his wife Sharon. Our guests brought the wet weather with them from the Northern Hemisphere.... or maybe it was Yvette and Michael Summers-Gervai, the New Zealand master franchisees who also flew in for the conference. Lenny was EXTREMELY pleased to see the Stanschus' - just a few days earlier he went to the airport to 'surprise' our visitors... but the surprise was on him as Chris and Frank unknowingly exited through another gate, leaving Lenny to entertain other passengers from a tour group who were fascinated by our furry friend! Their next stop was sunny Brisbane where Christine and Frank spent some time with Queensland and South Australia master franchisee Karen Tannoch-Bland and her husband Colby. Whilst in each of the states, Christine and Frank met up with Qld and NSW franchisees to get some feedback on how the brand has been developing in their states. It was also a great chance for franchisees to socialise together as a group. “It was fantastic to meet the fun, dynamic group of people who are setting the standard for pre-school sport in the Aussie market. The Little Kickers overseas business only really kicked off a couple of years ago but has now grown to represent a staggering 35% of the company's overall business - which is testament to the hard work and passion of the talented group of overseas franchisees we now have in place,” Christine said. While they were here, Christine and Frank also updated us on what’s been happening with Little Kickers globally. The UK has just launched Little Rugby and little Dance Flavourz through our overseas franchise network. Playgroup Queensland’s National Playgroup Week was packed with fun events for kids again this year and Little Kickers was at the heart of the celebrations. The major Queensland event, the Hyundai Playgroup Children’s Festival, was on 29 March at RNA Showgrounds where about 2,000 people from playgroups all over South East Queensland joined in the fun and games. Girls and boys from 15 months of age were kicking goals with us, some who had just taken their first steps! Our Coach Chris can help any child kick their first goal and it was Little Kickers on the road, with all our usual favourite games and fun soccer activities. Kids loved the chance to play with us and walk away with a sticker, hand stamp and balloon, as well as a snapshot of the types of people who run Little Kickers classes. Most of the coaches who came along were franchisee owner-operators who put 110 percent of their heart and soul into the event. Playgroup Queensland does an incredible job of organising National Playgroup Week, which coincides with Families Week each year. 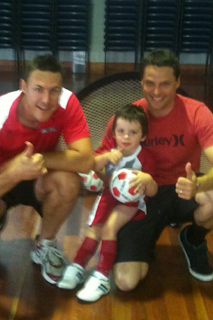 Little Kickers was also invited to join in a second event at Capalaba Regional Park on 27 March. About 400 people from the Bayside area joined in the Capalaba fun where Little Kickers organised soccer games and a playful obstacle course. Other activities included a baby animal farm, face painting, giveaways, messy play and fire trucks. National Playgroup Week was a major success across Queensland, with over 6,500 families participating in 36 events. Thanks to Playgroup Queensland for involving us in such fantastic events and we can’t wait to join in again next year! We were lucky enough to interview Lachlyn on Saturday at his Little Kickers Gold Coast class. Here is what Lachlyn, aged 4 had to say about Little Kickers. What do you like best about little kickers? Kicking Goals! What do you want to be when you grow up? A mechanic & Buzz Lightyear! 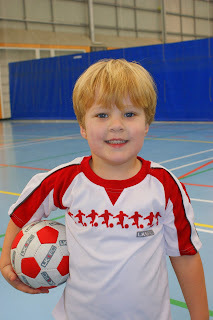 We love Little Kickers and the skills they learn and think it’s important for Lachlyn to be part of ‘A team’. He loves the big boy soccer outfit and wants to keep his ’real’ uniform on all day! 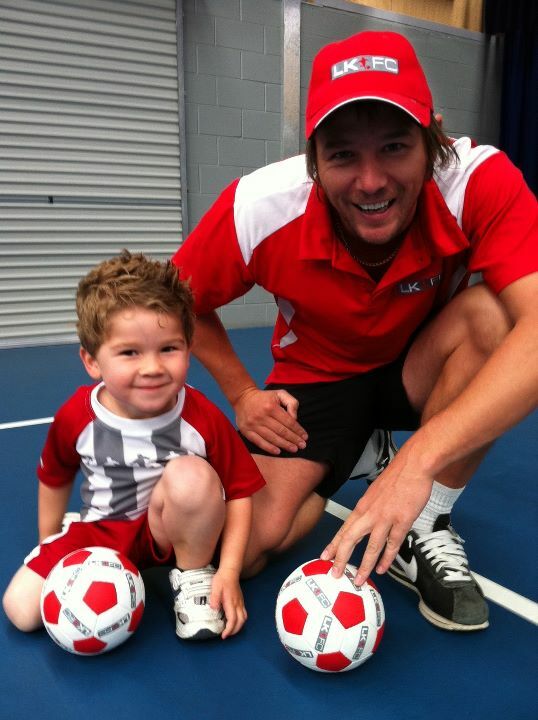 On Sunday we had the pleasure of interviewing Beau who attends our Gold Coast Burleigh Sunday Junior Kickers Class. Here is what Beau (and his Dad) had to say! Venues of Little Kickers attended? How long have you been coming to Little Kickers? What is your favourite little Kickers game? What do you like best about little kickers? Structured learning in a fun environment – Leaning physical coordination (soccer skills, etc), Practising mental alertness (listening skills, taking instructions and carrying these out properly, concentration skills, etc). ……and most importantly Beau loves it. Abbey at Little Kickers Gold Coast had the pleasure of interviewing Harry at Little Kickers Southport. Here is what Harry had to say about his favourite weeks activity. Little Kickers is a great way for young children to learn some early ball skills, to get some healthy exercise and most of all, to have fun! All the kids love it! Well we are already into our second month of 2011, how time flies when you are having lots of fun. We have now entered the year of the Rabbit, which according to the Chinese Zodiac is the luckiest year and I am hopeful that it will yield some sporting luck! We have just lost out on the Asian cup and Tandanari Lee is now a name that will evoke painful memories for Socceroos fans, just as the name Tim Cahill will forever do the same to a generation of their Japanese equivalents. It is all the more difficult for Australia fans to take because of the gilt-edged chances missed mainly by Harry Kewell, with form player Matt McKay also spurning a glorious opportunity to open the scoring inside the opening ten minutes. On the day, the better team perhaps lost but that doesn't mean Japan are the undeserving champions. The Socceroos will also have done their reputation on the continent no harm with the manner in which they have conducted themselves both on and off the pitch, a start contrast to the arrogance that surrounded their first Asian Cup campaign four years ago. Another chapter was meanwhile written in the colourful football history between these two countries and whilst there isn't a prevailing animosity, it is a rivalry that you sense both the players and supporters enjoy. In four years Australia will have the opportunity to go one step further when they host the tournament themselves, whilst Japan look to defend a crown that they deservedly hold. As adults we are constantly encouraging our children to bcome better at what they do, willing them to have the constant desire to increase their own motivation and to achieve greater things. Yet we often fall short of it ourselves year after year. At Little Kickers, from session to session we aim to improve many different aspects of childrens' lives; our carefully planned sessions include progressions that challenge the children both mentally and physically. The children most importantly are having lots of fun and learning lots of different concepts at the same time. These children may be the Socceroo players of the future; let's hope so as the fundamental skills they learn with Little Kickers will be invaluable whatever they decide to do later on in life. Here's to a great 2011 and the year of the Rabbit!